Now that we've covered variations on Santa Claus in English, French, Italian and Polish, it's time to turn our attention to German speaking Europe, where a number of versions of Santa abound. Both St. Nikolaus and Sankt Nikolaus are variations on Saint Nicholas, who is celebrated on December 6th. 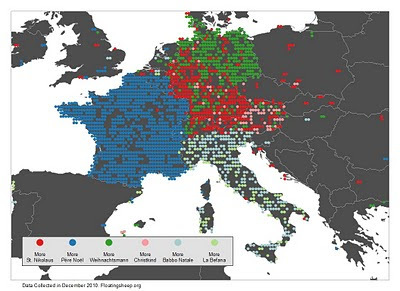 References to these keywords in the southern portion of Germany make sense, as this region is predominantly Catholic and would have more saints -- of all colors, shapes and creeds (OK, maybe not creeds as they're mostly Catholic) -- and be more likely to celebrate Saint Nicholas' Day. As a result of the Catholicism in the south, Weihnachtsmann, the guy who delivers presents on the 24th, is more prevalent in Northern Germany, which is mostly Protestant. Perhaps Weihnachten is less anthropomorphized in the south and more of a religious celebration. In the northern part of Germany, evangelic and and less tradition, the Weihnachtsmann bringing presents may play a more prominent role than the religious celebration. Also make sure to be careful with the spelling, as weih nackt mann has a completely different meaning. Other Santa-like traditions in Germany include the Christkind (Christ child), who also brings presents at Christmas, and is limited to a few scattered sites within our search. Based on a reader's suggestion (thanks!) 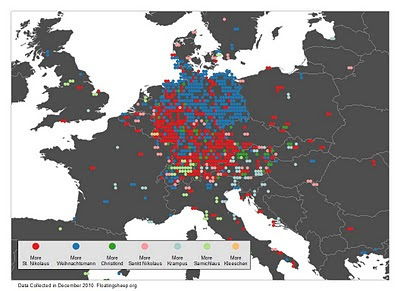 we included Samichlaus, which shows up as small but very clear cluster in Switzerland, and Kleeschen, which is a tradition in Luxembourg. Because we were able to see linguistic differences so strongly in our Santa maps, particularly the forthcoming map for Spain, we thought it would be worthwhile to focus on the distribution of the main names for Santa in French, German and Italian. We're particularly interested in Switzerland given its linguistic diversity. We should note that we're not including some local Swiss variants such as Samichlaus in these maps. Still some interesting results. There is fairly clear division between the French speaking cantons in Eastern Switzerland and the German speaking ones to the North and center. The Italian term of Babbo Natale doesn't seem to have made much headway into the country as of yet. Of related interest is that increased prevalence of Christkind in Austria which contrasts with southern and northern Germany. Perhaps this serves as the counterweight to to the Austrian preoccupation with Krampus (see map 1). 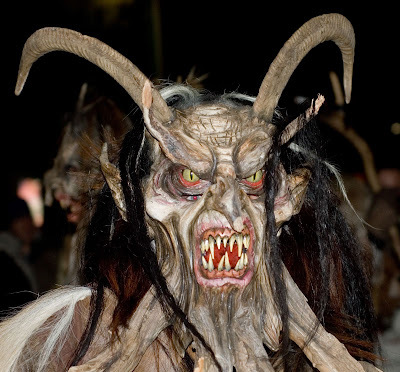 Given that Krampus is the evil one and not the one bringing gifts, this is a bit surprising. But then again, once you get a look at him it's easy to understand why Austrians might be fixated on him.